Welcome back to our blog series on the pros and cons of choosing the right type of rental property to invest in. 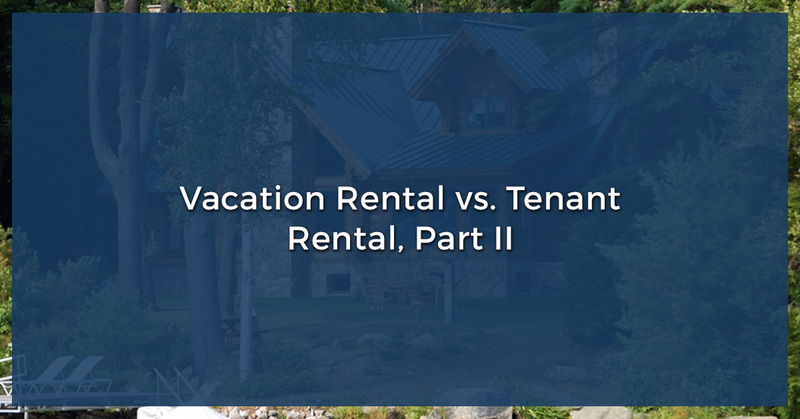 In our first blog, we looked spent a lot of time looking at setting up a vacation rental property — one that’s solely used for guests on vacation, looking for a place to stay on their trip. With a long-term tenant rental, this is a property that’s leased out to renters as their place of residence, usually for at least a year. There are plenty of benefits and drawbacks to each, and our non-recourse lenders at First Western Federal Savings Bank are here to help you make an informed decision. When you’re ready to apply for a rental property loan to acquire the investment property you’re looking for, work with our lenders to get the best experience possible! With vacation rental properties, there will likely be downtimes where business is not exactly booming. While vacation renters might churn out some hefty profits during the busy season, the off-season will find those same renters hard-pressed to find the same revenue. As someone with a long-term tenant rental property, you’ll have a steady source of income for the year — or even longer, should your tenants choose to renew their lease. You can plan on the same amount of income every month, similar to a salary — though it should be noted that this doesn’t count for any added expenses that come your way. When people rent out a vacation home, they’re expecting to be wowed and wooed. They’re not going to pack their own home with them, so you’re vacation rental property owners will need to pay for lots of the basic amenities. Appliances, beds, furniture, bathroom supplies, and even a TV set and wifi are expected, which add up to be a whole lot of upfront costs. A rental property for tenants, on the other hand, is basically a shell. Furnishing is an option, but more often than not, landlords and property owners don’t offer it. Other than appliances (and even that’s not a guarantee in some instances) it’s up to the renters to provide all these things to make their space a home. Not having to create a home for your renters saves a lot of money. Of course, a long-term tenant rental property needs upkeep, as is true for every property. You’ll need to make sure appliances are in good, working order, as well as cover any fixes as they arise (such as plumbing or HVAC issues). However, these fixes tend to be more sporadic and infrequent, especially when taking vacation homes into account. With a vacation rental property, every single time guests leave, the property needs to be prepared for the next guests. This involves extensive cleaning, much more so than making sure the shell of a rental house is set for the next long-term tenants. Plus, guests might have consistent questions or problems — all things that need to be taken care of ASAP, whereas long-term tenants quickly have an idea of what to expect. With a vacation rental, guests nearly always pay upfront with their stay. Even if, for some reason, they’re unsatisfied with their visit, you’ll still be guaranteed a profit. Certain long-term tenants might not be as stable. You can’t expect a renter to pay their entire year upfront, and if they run into an issue and suddenly aren’t able to make their rent, it’s a loss of income for you, one which could lead to eviction and other problems. Additionally, renters could end up causing a lot of damage to your property, either due to negligence, or solely as a result of spending one year in the same residence. Accidents happen, things break, people are imperfect, and when renters feel at home in your property, they might not always be as cautious and considerate as guests in a vacation home usually are. As we said, guests in a vacation home know they’re guests. They treat everything with a little more reserve and hesitation, simply because they’re on vacation and it’s not their home. Long-term tenants are in your property, but it’s their home, which can mean comfort and carelessness go hand in hand. Some of the damages could be much more costly at the end of a lease, versus the end of a month (or even a year) for vacation rental property owners. Many vacation property owners live very close (if not on) the premises of their rented-out vacation home. As someone who owns a tenant rental property, the chances that you live next door or down the street from your rental are slim. If the pipes burst in wintertime in the middle of a blizzard, or some springtime flooding results in a lot of damaged carpet while you’re the next state over, it might be much more challenging to get to the issue quickly — which might end up costing you more, particularly in situations where time is of the essence. No matter what type of rental property you decide to invest in, it’s going to have incredible benefits to help boost your financial portfolio. Figuring out whether you want to turn your rental property into something for travelers or tenants to love can seem tricky, but it’s also an exciting time to think about your future investments. First Western Federal Savings Bank is here to help. Apply for a rental property loan with our non-recourse lenders to get started!